Since most time-era Titanic collectibles can have significant value, it may be a good idea to have the knowledge needed to identify modern verses vintage paper relics. This can include postcards, fabrics, photographs, rare paper artifacts, and even fake autographs on modern paper that has been artificially aged. As an example, how many times has a very rare Turkish Bath ticket surfaced and been fraudulently (or unknowingly) sold as an original? 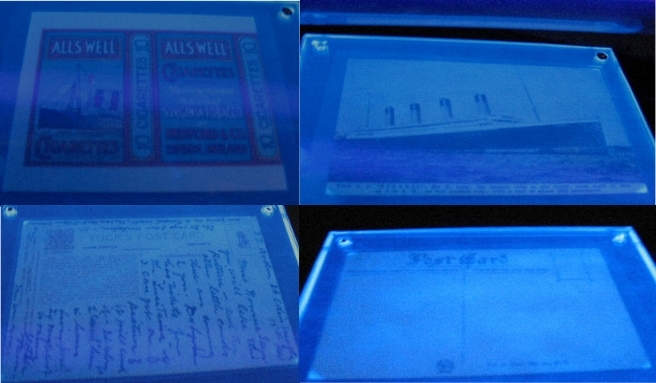 Blacklights are useful in identifying most but not all modern stock paper. This is because sometime in the 1940's chemical brighteners were added to a variety of products to give them a more appealing look under natural light which has ultraviolet rays. It quickly caught on, and ever since, most paper stock will give a brighter illumination when held under a blacklight. This is also helpful in detecting vintage card stock that has been modified or improved using newer material such as paper, starches (used to bond) and some adhesives. Most novice collectors can quickly and easily identify modern paper stock which can be reprints, fakes, or reproductions. If paper stock fluoresces very bright as just described below, it was almost certainly was made prior to the 1950's. Be aware that this will not work for modern printing on vintage paper, which is typically seen in high-end fraud. It also does not work for some rarely seen modern paper stock that does not have any normal additives for brightness. 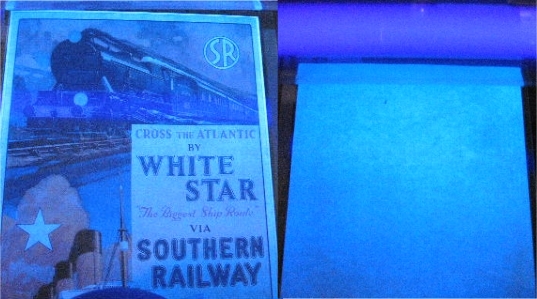 The poster to the left was advertised as an original time-era White Star Southern Railway poster. This is a highly desirable collectible both for its link to to the Titanic, as well as being a colorful rare print. By appearance it would seem that it is in mint condition with the appropriate amount of toning (aged color) that is somewhat uneven. Something to look for in original collectibles. If it's too evenly toned it may indicate it was man-made and not part of the natural aging process. As seen under a blacklight, the seemingly time-era poster instantly reveals the brightness and illuminance of modern paper stock. If this was an authentic poster it would have a darker appearance and be somewhat dull in color. Here is a group of authentic paper collectibles from (or about) the time of the Titanic tragedy. All of these can be seen in true color on various pages of this website. Note that each does not display any degree of fluorescence when held under a blacklight. The results would indicate that these are not modern reproductions and were printed prior to the 1950's. This gives the collector a reasonable amount of satisfaction that the paper artifacts have a high probably of being time-era and authentic. 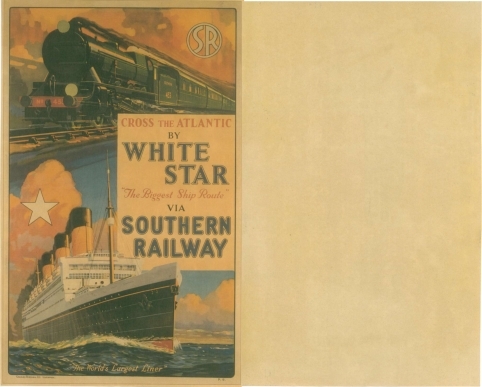 To give a better perspective, a vintage postcards displaying no signs of abnormal brightness are placed on top of the fake modern paper stock White Star Southern Railway poster. The picture to the right shows an original Titanic postcard placed on top of the back side of the poster. Notice the difference of illumination when both are placed under a blacklight. Again, the vintage cards are dark and dull as compared to the bright modern stock behind it.